The Second Judicial District Commission on Judicial Performance, on a vote of 10-0, recommends that Judge Johnny Charles Barajas BE RETAINED. 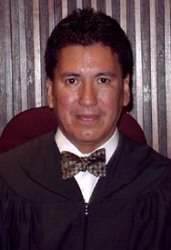 Judge Barajas became a Denver County Court Judge in January 2003. Judge Barajas graduated from Colorado State University in 1981 and received his law degree from the University of Denver in 1984. Judge Barajas currently is assigned to the municipal criminal division of the Denver County Court and also hears mental health matters. His work on mental health matters occurs in a problem-solving court known as “Court to Community,” which serves individuals with mental illness and substance abuse issues and has resulted in a 70% reduction in re-arrests and an 80% reduction in days spent in jail for its participants. Judge Barajas finds his work in this court particularly rewarding. Judge Barajas previously presided in other divisions of the Denver County Court. Prior to his appointment, Judge Barajas served as a district court magistrate in Adams County. Judge Barajas began his legal career at the Legal Aid Society of Metropolitan Denver in 1984. He then practiced with two Denver law firms before opening his own practice. He later was appointed a magistrate for the City and County of Denver and presided in night traffic court. Judge Barajas engages in community service that includes packing holiday food baskets for the needy, captaining a dragon boat race team, and speaking at scholarship award ceremonies. The written comments further support the recommendation to retain Judge Barajas. Attorneys described him as patient, fair, dignified, “a professional, competent decision-maker,” and “not biased towards the defense or the prosecution.” Non-attorneys described him as courteous, fair, just, neutral, and having “a strong sense of dignity in the process.” Commissioner observations of Judge Barajas’s courtroom were consistent with the survey responses. The reviews of his written work demonstrate a thoughtful judge who knows the law and writes well. Although the Commission unanimously voted to recommend retention, the Commission noted that a consistent theme in Judge Barajas’s evaluations (both attorney and non-attorney) was that he can be temperamental. If retained, the Commission encourages Judge Barajas to strive to improve his judicial demeanor.